Humanity needs to further develop environmentally-sound and sustainable technologies that provide value through maintaining or enhancing plant production efficiency in the face of a changing climate. One way to meet this need and reduce agricultural dependence on synthetic chemicals is to use microorganisms or their fermentations to provide similar services. Because of this, there has been a dramatic increase in the application of microorganisms in agriculture during the past ten years, especially in organic systems and throughout the developing world. The goal of this Scientific Team (ST) is to develop a platform for the development of new plant-associated microbial bioproducts that can be used to enhance the efficiency, quality, and overall productivity of living plants. To do so, we have assembled the expertise needed to perform the fundamental and applied research that is necessary to rapidly identify, establish, refine, and apply new microorganisms to a variety of market sectors, including greenhouse, field, and landscape production of plants. In cooperation with industry partners, this ST will focus its research and development efforts on plant-associated microorganisms (and their secretions) that enhance the quantity and quality of farmed plants. Such research will lead to the commercial launch of valuable new biofertilizers and biopesticides into marketplace. Currently, this ST is working on the commercial development of a patented algae-based biofertilizer (ABB). Matt Kleinhenz’s lab will conduct assessments on ABB in greenhouse and field trials. Specifically, he will evaluate and coordinate microbial bioproduct integration into appropriate, high-value hydroponics, greenhouse, and field production systems. He will also evaluate treated produce to determine whether or not plant responses in model production systems alter food quality. Joshua Blakeslee's lab will evaluate plant physiological responses to ABB symbionts and their secreted metabolites, especially root cellular responses related to nutrient transporters and phytohormone production and response patterns. Christopher Taylor will lead the transcriptomic analysis, linking host transcriptional responses to the metabolic responses assessed by Drs. Blakeslee and Graham. Together, such analysis will lead to identification of the active symbiotic mechanisms that may be enhanced through the formulation process and ensure efficacy during large scale production of the ABB. 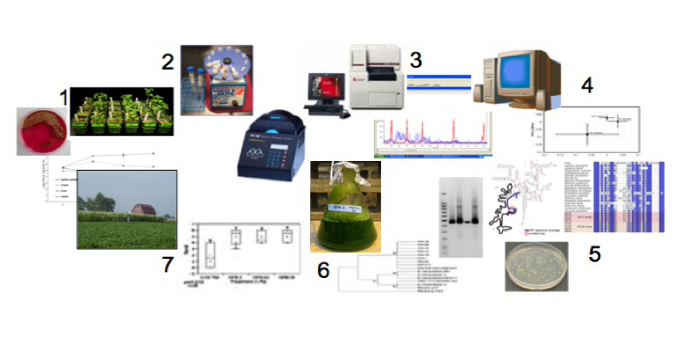 Image: Platform components for the discovery, characterization, formulation, and application of microbial bioproduts to modern agricultural production.